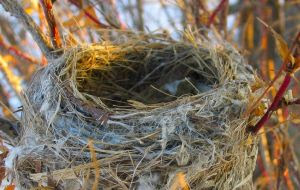 With two out of two children in college this week, Sandra and I are starting to experience the empty nest syndrome. That is not to say that we're feeling any major depression or loneliness. After all, we managed the first seven years of our marriage without children, and we still have a couple of cats to feed, water, and take care of (Hmm, I remember the kids PROMISING that they'd take the cats way back when I agreed to let them stay. Luckily, I never believed that for a minute!). The most noticeable change to our lives in the empty nest will probably be cooking. What used to be a no-brainer meal for four is now too large for just the two of us, so we will need to keep reminding ourselves to reduce the amount when we are purchasing. That package of a dozen chicken breasts for $1.99 a pound is no longer as good a deal as it was before: be thrifty that way too often and you'll soon find your freezer overflowing with food you'll never use before it gets freezer burn. Another thing we took for granted was having one or two talented children able to either cook a meal for us (Chardonnay loves making Spicy Pork!) or do the "sous chef" chores like peeling shrimp or dicing vegetables. Now we have to do it ourselves. Not a big deal, but it's a change of mindset. There are many books out there on how to cook for two. It's not that it's rocket science, but rather constantly reminding ourselves that three quarter pounds of ground beef is probably going to be more than enough for a meal and that we can get by with a single breast of chicken, etc. Yesterday was our first "just the two of us day," so we made baby back ribs in the smoker. A single rack was good enough for both of us. We seasoned the ribs with generous amounts of various BBQ seasoning rubs, lit the coals, soaked some mesquite chunks, added water and beer into the drip pan of the smoker, assembled everything, and let the ribs smoke for about four hours. Later on, Sandra sliced up a small Italian eggplant and zucchini with some spices and olive oil, microwaved a couple of Idaho potatoes, and I prepared a single Portabello mushroom with olive oil and seasonings. After the ribs were smoked, we started the gas grill and the put the veggies, mushrooms, potatoes on the grill. Meanwhile, I "painted" some BBQ sauce on the smoked ribs and put them on the gas grill as well (only to finish cooking; we wanted to ensure they were cooked through). We finished with some roasted corn on the cob. The meal came off perfectly, which made us happy that cooking for two isn't going to be such a chore. In fact, after a couple of weeks, I'm hoping that it will be just as easy thinking of cooking for just the two of us as it was to cook for three and four hungry mouths in the past. When the kids come home for an extended stay around Christmas, we can start the bigger meals once again. I wonder if anybody will be hungry for a crown roast of pork? Hmm? Another by-product of your empty nest is a college student with a kitchen learning to try to make dishes for two. Not two of her family, where the taboo items are normally just mushrooms and pickles, but with a person who has more "not fond of" foods than "fond of" foods, it seems. Thinking about it, in most recent years we've been going out more than cooking in, where I've cooked 2-3 meals each day for 1 1/2 weeks, with a person who has really never cooked before, other than microwave pizza. Jay's learning, though, but I think that it is kind of ironic that you and I both have to portion out the meals we make.